third in 1911 at Caerleon Racecourse, Wales in 1911. Wilson also won the bronze medal in the 10000m in the Antwerp Olympics in 1920. This club profile concentrates on the period immediately after the Way when they were genuine competition for the very best clubs of the time and indeed won medals in the Edinburgh to Glasgow – not easy when we know already how good Victoria Park, Shettleston and Bellahouston were not to mention Wellpark, Springburn, Clydesdale and Edinburgh Southern were. The club had been successful before the war and had won the ‘most meritorious medals’ in the last pre-war race in 1939 when they were seventh behind Maryhill, Bellahouston, Shettleston, Plebeian, Garscube and Dundee Thistle Harriers with a team that included Alex McLean on the long leg and J Wilson on the second stage. 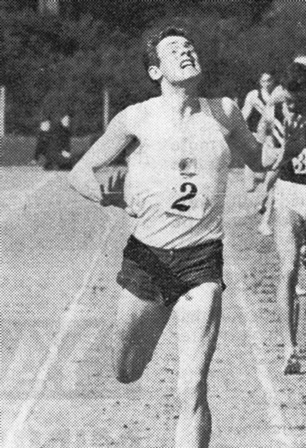 Alex Maclean, who won so much in the colours of Bellahouston Harriers after the war had started out as a Glenpark Harrier and won the club cross-country championship six times, and also won the Renfrewshire 7 miles cross-country championship and track 3 miles title. He also won the British Territorial Army championship in 1939 and resolved to retire when the war started. He was talked into coming back into the sport by none other than Sydney Wooderson in 1942. It was a big loss when he joined Bellahouston on his return to Civvy Street. The war interrupted many careers and deprived many clubs the pleasure of seeing a good squad mature the way it would have liked. At the start of the 1946-47 season, there was no sign of Glenpark in either the Dundee Kingsway Relay or the McAndrew Relay at Scotstoun either but there were signs of promise in the newly established Clydesdale Harriers Youth Race in November 1946 when W Williamson finished third after ‘a real dust-up’ with T Millar of Kilbarchan for second place. Further down the field was D Kennedy who was fifteenth and a member of the winning Ballot Team. The first real test for the seniors however was in the South Western District Relays where there were three teams from Greenock forward – Glenpark, Wellpark and the now defunct Auchmountain Harriers. The race resulted in a victory for West Kilbride from Auchmountain and Wellpark with Glenpark finishing fifth of the 18 teams in the race. In the South Western Championships however, the team was third behind Auchmountain and West Kilbride with their top man, William Mclean being second and W Williamson finishing third. Other counting runners were J McNab 13, J Blackwood 19, J McCall 20 and R Delussy 23. When it came to the National Championships at Hamilton in March however, Glenpark in seventh place was easily the first of the teams from the South Western District to finish – the runners were D Turner 30, T Mearns 44, W McLean 53, J McNab 71, B Leitch 74, and C Berry 75. Into winter 1947-48 and, like Wellpark and Auchmountain, Glenpark did not run in the McAndrew Relays at Scotstoun but did put forward a team in the Renfrewshire Relay on 8th November in Paisley and, taking the lead at the end of the third lap they went on to win with W Williamson running a good last lap in 16:41. The report concluded Glenpark, a fine balanced team by their times, Turner 16:46, Armstrong 16:52, W McLean 16:40 and W Williamson, 16:41, deserved their victory for their concentrated effort.” McLean and Williamson were fourth and fifth fastest times. For the record second and third were Bellahouston B (2nd) and Bellahouston A (3rd) with Alex Mclean being third fastest time. In the National Novice Championship at Pollok on 22nd November and they finished seventh – again the first South Western team by a distance, West Kilbride being fifteenth. Top club runner was W Armstrong in fifth. In the same issue of the ‘Scots Athlete’ Emmet Farrell said that the main feature of the South Western Relays was the title changing hands and going to Glenpark. In the race itself (held at Beith in December), The report read that the trail was very heavy, ‘taking in two ploughs’. At the end of the first lap, Adamson of West Kilbride led veteran D Turner of Glenpark but on the second stage W Armstrong moved into the lead. W McLean handed over a 70 yard lead to young W Williamson who had some job to hold off Internationalist J Reid of West Kilbride. He managed it however to see his team win by 10 yards – the runners and times were Turner 14:53, Armstrong 14:52, McLean 14:39 and Williamson 14:31. They also had first B team home, they finished ninth of fifteen teams forward. Williamson was second fastest of the day behind Reid. This all led Emmet Farrell to say, “In the South West District Junior Championship, I fancy Greenock Glenpark to win the championship held by the other Greenock club, Auchmountain Harriers who of course suffer the usual depletion of a winning team rising to Senior status. For individual honours, the issue appears open but W McLean of Glenpark Harriers and J Fisher of Ayr, 2nd and 3rd last year, both appear to be sound chances as should W Williamson of Glenpark.” The forecast wasn’t too far out – Fisher won by 10 seconds from Williamson with McLean third. And Glenpark won the team title with 62 points to Doon Harriers’ 131. The team was W Williamson, W McLean, W Elder 10, J Armstrong 14 D Morrison 15 and B Leitch 18. Willie Elder would of course go on to be a tremendous club servant filling the difficult position of secretary for many, years before his early death. In the National Championships they were in the top ten, just when the club was led home by W McLean in fifth place with other counters being D Turner 17, W Elder 81, B Leitch 82, D Berry 90 and W Fullerton 97. In the Youths Race they were sixth with the runners being J Armstrong 6, S Williamson 24, J Aitchison 42 and H Beaton 48. In his annual review of the year, Emmet Farrell opined that W Williamson had the ability to match and maybe even outdo some of the established stars and mentioned his beating of all the Bellahouston strs in the South estern championship. W McLean made the Scottish team for the interational for the first and only time that year and finished forty ninth. Glenpark sent a not one, but three teams to the Victoria Park Road Relay on 3rd October, 1948, with the first team finishing eighth. The men were W McLean 16:26, : W Elder 17:02,S Williamson 17:07 and W Williamson 16:29. On 20th November, the team was eleventh , led home by S Williamson in 18th place of the 251 starters. Then in the South Western Relay in December, an interesting race saw them lose their title to local rivals Wellpark by 45 seconds. There were twenty teams forward for the trail from Wellpark HQ which consisted of one and a half miles country with half a mile road at the start and again at the finish. Not in the first three at the end of the first lap, Glenpark took the lead on the second thanks to H Beaton. John Stevenson took the lead on the third stage and handed over a six second advantage to brother Tom. The chase by W Williamson proved futile though and Tom Stevenson came home a comfortable winner with the fastest time of the day, Williamson was third fastest and the Glenpark team and times was S Williamson 12:38, H Beaton 12:55, W McLean 12:51 and W Williamson 12:10. Showing strength in depth they had the first second team (8th) and were the only club with three teams out (C Team was sixteenth out of twenty). This was fairly significant in that the first post-war Edinburgh to Glasgow Relay was to be held in April 1949. In his preview of the National Championships Emmet Farrell named W Williamson and W McLean among those who should run prominently. The club had not done well in the South Western Championships, finishing only ninth but few of their top me were out in the race, S Williamson leading the club home in twentieth place. It was a bit different in the National although the finishing place was also ninth. The men in the team were W Williamson 13, J Grant 35, W McLean 43, W Elder 86, C Berry 102 and B Leitch 106. Strangely enough, S Williamson was 13th in the Youths race with H Beaton 42, JK Aitchison 71 and and W Cooper 77. But the big relay was still to come – the first post-war Edinburgh to Glasgow was held on 23rd April 1949. First off for Glenpark was W McLean and they could not have had a better start – he was second, four seconds behind Shettleston and four seconds in front of Victoria Park with the next club 49 seconds back. J Grant ran the second stage – and he held on to second place with the third fastest time of the day while VPAAC dropped back to fourth. The third stage was covered for the club by B Leitch who dropped to fourth, thanks to first class runs from the Garscube and VP runners who moved into second and third. H Beaton dropped back to sixth and then Willie Elder dropped another place to seventh. Top gun W Williamson ran the long sixth stage for the club and brought them back up to fourth with second fastest time of the day behind George Craig of Shettleston and 25 second faster than Alex Mclean running for Bellahouston on the same stage. S Williamson held the place with the second fastest run on Seven and on the last leg D Turner kept fourth with third quickest on the stage. The award for the most meritorious unplaced performance of the race went to Vale Of Leven AAC in eighth place in their first run in the event, having been founded only three years previously. There were many good scalps taken that day – Edinburgh Southern, Maryhill and others – and the club had had four outstanding runs, on stages one, two, six and seven with a very good one on eight. In the Edinburgh to Glasgow in November that year, there was no W McLean – but there was an A McLean but no A McLean in the Bellahouston Harriers team sheet. Alex had returned to Glenpark. However the team in November was a bit different from that of April. S Williamson ran the first stage this time and finished fifth and was followed by W Williamson on the tough second leg who moved up to thrid with the third fastest time of the day. B Leitch on the third stage had the second quickest run of the day to keep a hold on third place before J Grant dropped back to fourth. H Beaton on five and A McLean (second fastest on Six) held the place as did I Sinclair and D Farren on the last two stages for the club to finish fourth again. The most meritorious medals this time went to Edinburgh University in fifth place. That was November, but how about the rest of the 1949-50 season? It started with a very good third place in the Victoria Park Relays at Scotstoun,The team of W Elder 16:50, A Mclean 16:03, S Williamson 16:32 and W Williamson 16:20 was remarkably even paced and Alex Mclean was fifth fastest of the day. On to the South Western District Relays where the A team was second and the B team sixth. The A team was H Beaton 14:27, S Williamson 14:16, A Mclean 13:50 and W Williamson 13:56 and W Williamson was fifth fastest time. The B team were all in the 14:40’s. On 2nd January there was a new race run – the Helensburgh to Clydebank which would transform itself into the Clydebank to Helensburgh by the next running but it was run in January 1950 and was won by Alex McLean in 95:03 – an excellent time for the largely uphill course and run in January! A month later – 5th February, Glenpark won the South Western District Championships with Alex Mclean taking second place in 46:22, just one second ahead of Willie Williamson in third. The team was McLean, W Williamson, A Williamson 7, J Grant 10, H Beaton 12, W Elder 13. Emmet was quite clear in his forecast for the National championship that Alex Mclean would be in the team for the international. It was not to be however – there was no finishing team from Glenpark and Mclean was down in sixteenth position, with W Elder 97, B Leitch 112, C Berry 132 and T Mearns 138. Despite the good result a year earlier, there was no Glenpark team in the 1950 Victoria Park Relay at the start of October but on the 28th of the month they ran a team in the Renfrewshire Relay where they finished third behind Bellahouston and Wellpark Harriers, Their team was S Williamson 14:25, A McLean 14:32, J Grant 14:43 and W Williamson 14:16. W Williamson was third fastest on the day. On 4th November they were fourth in the South Western District Relay with the same quartet running in times of 14:34, 14:45, 14:31 and 14:27. The Edinburgh to Glasgow was held on 18th November and was to prove very significant for the Greenock club. S Williamson had a good Stage One to cross the line in fifth place only 30 seconds down on the leader, F Bradley of Monkland and one place behind Ian Binnie. J Grant on the second stage had a very good run to pull the club up to first place, 45 seconds ahead of Shettleston and in the fastest time of the stage by 29 seconds. J Osborne on the third stage managed to hold on to first place but the lead was cut to 12 seconds by J Smart of Edinburgh Southern. On to the fourth stage where W Williamson had a poor run for him and dropped to fourth place and Willie McLean ran well enough but could only hold on to fourth place before handing over to Alex McLean on the long 7 miles downhill leg who pulled in one place with fourth quickest time on the stage. Willie Elder dropped down to fourth before W Armstrong overtook Edinburgh Southern to clinch the third place medals. To win a medal of any colour in the Edinburgh to Glasgow was always a tremendous feat but at that point in the history of Scottish endurance running, it was a wonderful performance. After finishing fourth and fourth, third was a just reward for their efforts. In the South Western District Championships on 3rd February 1951, the team was second after a great example of team packing – their first runner was 10th and their last scoring man was 17th! The heroes were C Fitzharris 10, J Grant 11, W McLean 14, H Beaton 15, A McLean 16 and J Armstrong 17. The race was won by Irvine YMCA and Wellpark Harriers were third. After the great team results of the winter, the National was a bit of a disappointment: the team was tenth and the first counter was Alex Mclean in 25th with Willie Mclean in 44th, W Williamson 63rd, D Farren 85th, C Berry 96th and T Mearns 97th. Cross-Country season 1951-52 started with the McAndrew Relay on 6th October when their squad was seventh and runners were S Williamson in 16:23, A Mclean in 16:20, J Osborne in 17:06 and W Armstrong in 16:42. On 27th October in the South Western Relays, the club was second to Irvine YMCA by seven seconds. The team was I Osborne in 14:19, W Armstrong in 13:34, J Grant 14:15 and S Williamson in 13:59. The Edinburgh to Glasgow was held this time on 19th November and the club sent out S Williamson to do duty for them on the first stage. He finished sixth, one place and seven seconds ahead of Ben Bickerton of Shettleston Harriers and 70 seconds down on the first man. The baton was passed to J Grant who moved up one place with fourth fastest time of the day. He was followed by H Beaton who dropped all the way from fifth to tenth. The long climb back up the field was started by W Armstrong on the next leg who moved up to eighth with fourth fastest time and then W McLean took the club up two more places to sixth before Alex McLean dropped back down to seventh on the ferocious competition of the sixth stage. Two stages to go and H Coll held on to seventh before J Osborne moved up one place to sixth n the last stage. But for the third stage, the team could have been among the medals again. In the Renfrewshire Championships in Pollok Park on 9th January 1952, the team was second to Bellahouston with Alex Mclean leading them home in fifth place. The remainder of the team was J Osborne 9, J Armstrong 14, H Coll 15, S Williamson 19 and J Grant 20. There was no senior team in the Nationals in 1952 but the Junior team of I Osborne 12, S Williamson 20, W Muir 56 and W Soutar 62 was tenth and there was one runner in the Youths race – J Gillon was sixth. This section of the website is called The Fast Pack and this particular group of Glenpark Harriers had no star – unless it was Alex Mclean who was arguably past his peak when he returned – and the results obtained were the result of teamwork. It was teamwork which led to their two fourth places in the Edinburgh to Glasgow and to the club taking bronze in the event in an age when the standard was remarkably high in Scotland. Well worth a place in any fast pack!